Santolina is a genus of dwarf and evergreen shrubs known for their aromatic summer flowers. Originally native to the Mediterranean climate, most species of Santolina can be grown in tropical and sub-tropical regions. Among many cultivate species; S. chamaecyparissus is more popular because of its attractive silvery foliage and button-like yellow flowers. The plant is commonly known as Cotton Lavender or Ground Cypress. Santolina chamaecyparissus is an easy-to-grow plant that prefers in hot, sunny, and well-drained sites. The plant grows as a dwarf (up to 1 to 1.5 feet high) and dense shrub ideally suited to small dividers or hedges in landscape designs schemes. 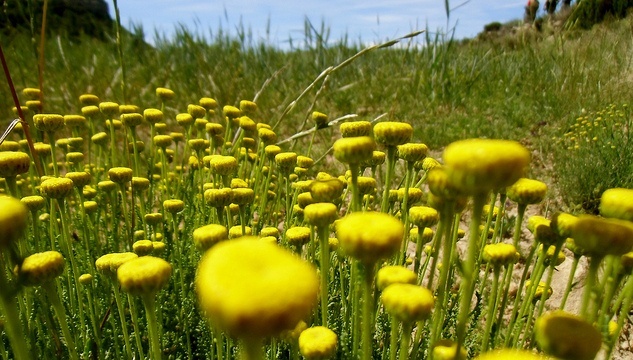 Santolina chamaecyparissus performs well in sandy and loamy soil with average watering. Generally, it is a low-maintenance plant that should be trimmed after each flowering season to keep it compact and in good shape.